To be notified about upcoming Family Programs at the Museum of Health Care, please subscribe to our Family Programs E-Notice. Discover the histories of three healthcare professions - doctor, nurse, and druggist - then try your hand at their trades! Suitable for ages 6-12. Clicke here to view photos from the program. In 2016, our March Break Program gave kids a chance to sink their teeth into the history of dentistry and oral hygiene. Participants learned about how early civilizations took care of their teeth, visited a dentist from the 1920s for a check-up, and made toothpaste used by the early settlers in Canada. The program let kids learn how important it is to have healthy teeth and how they can keep their teeth healthy in the future. The program was offered to children 6-12 and guardians were welcome to attend. Click here to view/download the poster for this program. Click here to view photos from this program. 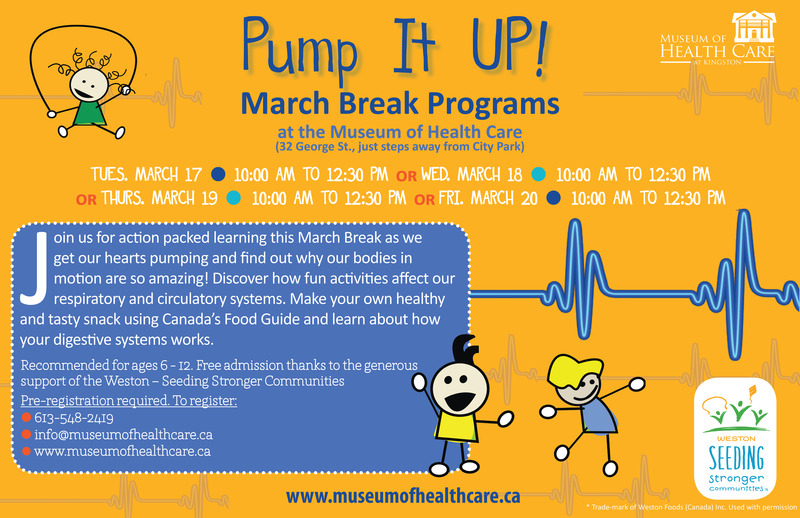 In 2015, our March Break Program was action packed with learning as we got our hearts pumping and found out why our bodies in motion are so amazing! Museum docents taught students about their respiratory and circulatory systems, while local fitness experts led in fun activities. Participants were encouraged to make their own healthy and tasty snack using Canada's food guide and learned about how the digestive system works. The museum was thrilled to be able to offer this program for free thanks to the generous support of the Weston Foundation - Healthy Active Kids. This program was offered to children ages 6 - 12. Click here to view/download a poster for this program. How big is your brain? Where do you store memories? What is “brain freeze”? 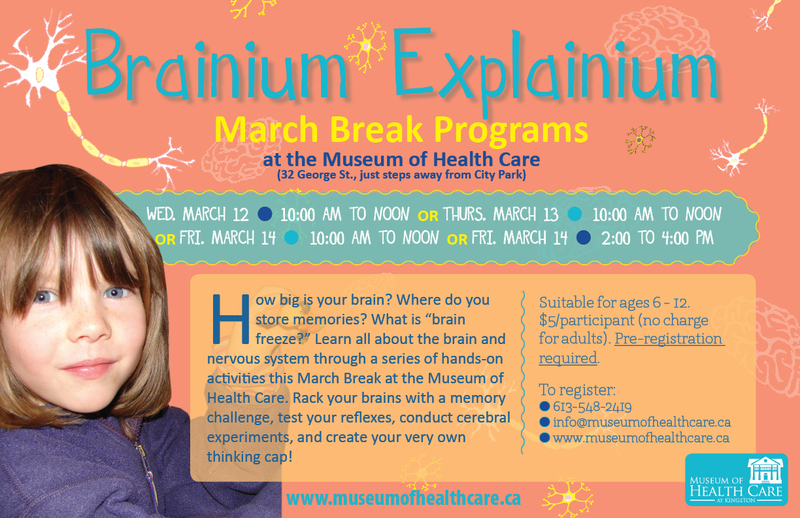 In 2014, March Break Program participants ages 6+ learned all about the brain and nervous system through a series of hands-on activities. They racked their brains with a memory challenge, tested their reflexes, conducted cerebral experiments, and created their very own thinking caps! 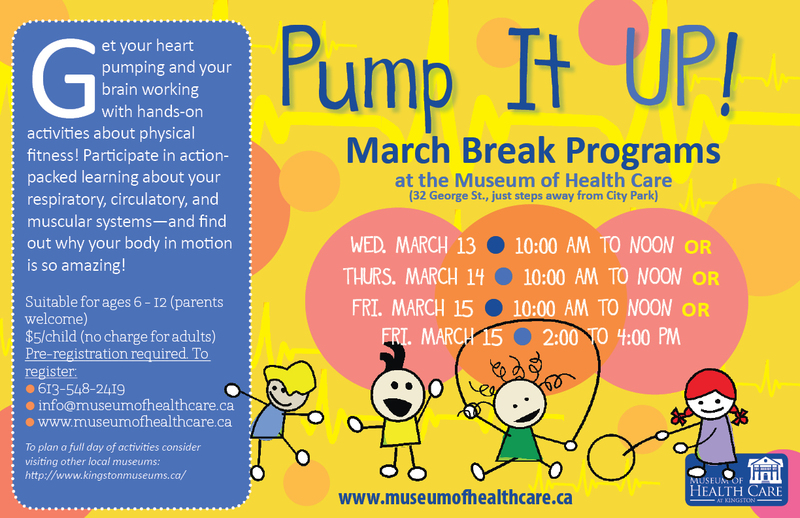 In 2013, March Break Program participants got their hearts pumping and brains working with hands-on activities about physical fitness! They enjoyed action-packed learning about our respiratory, circulatory, and muscular systems—and found out why our bodies in motion are amazing! The program was offered to children and youth aged 6-12 and parents were welcome. In 2012, the "Yum, Yum, MUNCH!" 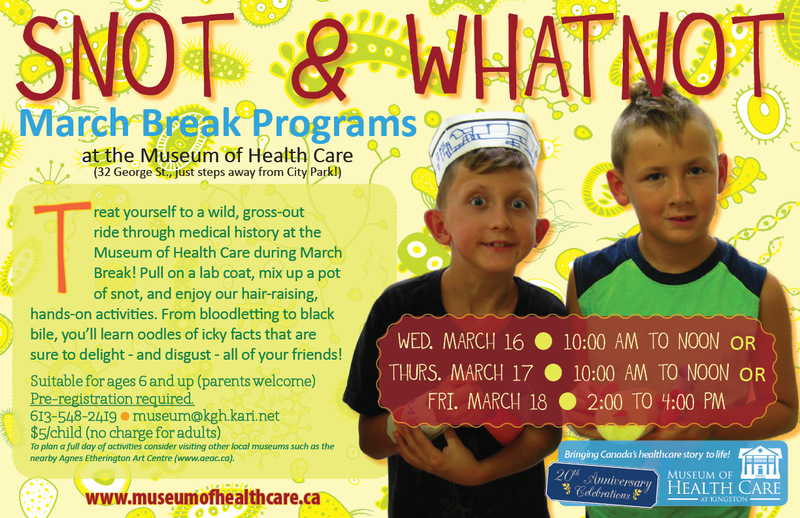 March Break Programs at the Museum of Health Care invited participants to dive in and discover what happens to the food they eat during a hands-on adventure through the twisty, turny world of the digestive system! Participants super-charged their energy levels with a series of activities all about healthy eating and digestion that had everyone's tummies rumbling. The program was offered to children ages 6+, and parents were welcome to attend. On March 16, 17 & 18, 2011, kids (and adults!) were treated to a wild, gross-out ride through medical history at the Museum of Health Care! Participants pulled on lab coats, mixed up pots of snot, and enjoyed our hair-raising, hands-on activities. From bloodletting to black bile, participants learned oodles of icky facts! The programs were offered to ages 6 and up. View/download the poster for this program. In 2010, the "Our Funny Bodies" March Break Programs gave participants a chance to shake their phalanges, hear their hearts beating, race to construct skeletons, engage all five senses, and discover fascinating details about the human body through hands-on crafts and activities. These programs were offered to ages 6 and up.